Just started or already a veteran? Your skyblock island is small, or doesn’t have a mob farm? Need XP or mob drops? Feeling brave enough? When you walk out those doors, all protections are off (Note: pvp is disabled and not allowed!). It’s just you, your weapon and your friends watching your back! On the most distant corners there are 4 level 30 enchantment tables. If you can reach them and survive long enough, get your items enchanted for free there. You can earn lots of XP and mob drops fast, or lose everything just as fast. It’s just up to your combat skills to keep you alive. Everything you can grab including items dropped by other players upon their death it’s yours to keep. If you can get out alive! Spend some time in there, learn the map and you’ll find out some places are easier than others. Who knows? You may even find that elusive perfect farming spot with minimal risk of death. This entry was posted in Minecraft Skyblock Server News on February 3, 2013 by heatseeker0. That’s correct. It can be useful no matter what your gear level is. No gear, stand by the door and catch the occasional mob that passes by. Pro gear, enter and fight for an hour or more until your gear breaks. Lawls or the griffins3 strategy (invented by me as i was one of the first people to use the warp): run around in circles picking up the mob drops left by dead mobs as well as the exp. also pick up the items left by dead people. When at 2 or less hearts do /warp deathtrap and ESCAPE!!! 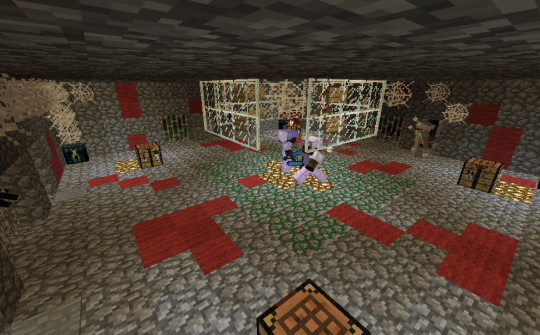 Then deposit items in enderchest. Repeat. When im at the top of my game i can stay out for about 10 minutes. Doing this strategy gets about 1stack of each mobdrop as well as about half a stack of food, some tools, some enchanted items, and a few dia items in an hour.